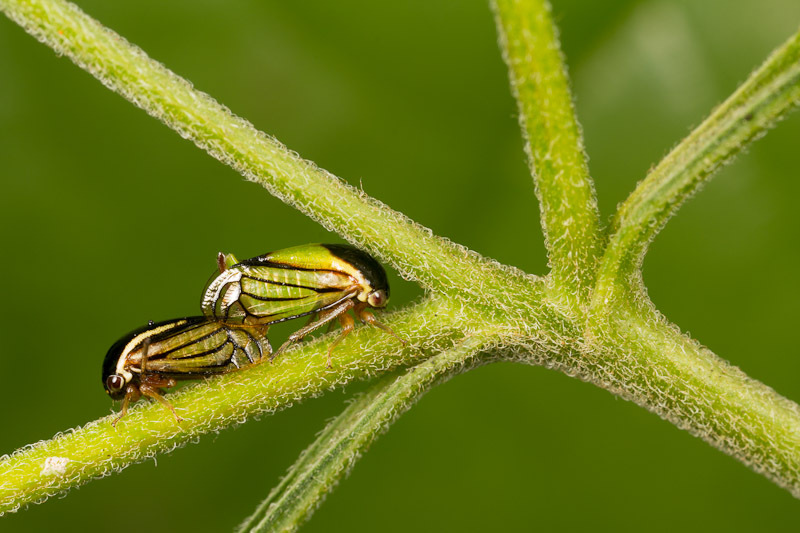 These mating treehoppers (Acutalis brunnea) picked a good place to get together, at least from a photographer’s perspective. I like the composition of this full frame image, but there’s so many different ways I could crop it. Here’s a closer look at the pair. I’ve stared at the full size image, but I can’t decide which one is male and which one is female. As to which is which: most insects the larger is the female, so the upper. Nearly all insects the genitalia are off to the left side, not quite at the end of the abdomen in females, at the end in males. So the male abdomen fits in below the females on her left side. If they are back to back like this, it tends to push the female up higher. Finally, I believe the brownish item between the back of the wings on the right hand insect is an ovipositor, so therefore female. Then again, I know nothing specific about treehopper mating. All Good points. Ted concurs so you know more than you suspect! The more I do this, the more I find myself preferring photos with insects placed in interesting compositions rather than the closest possible view of the insect (not to say the latter does not have its use, however). In this case, the cropped one went to BugGuide :). I’ll update it to indicate that the male is on the left.